First of all, I would like to protest this topic and simultaneously apologize to anyone who was near me while I was writing it. When it comes to which songs get stuck in my head, the only criterion seems to be "whatever song I most recently heard." When we would go on trips when I was a kid, the radio was always turned up pretty loudly. Some people might think that's because my dad is hard of hearing.Well, that might be true, but the real reason the radio was up so loud was so it could drown out my singing! Nowadays, I have to be careful with the music in my office. If I listen too often, I start singing along and the people out at the main desk can hear me. My boss was actually worried about sharing an office with me last summer because he heard about my constant singing! So the following are not just songs that usually get stuck in my head. 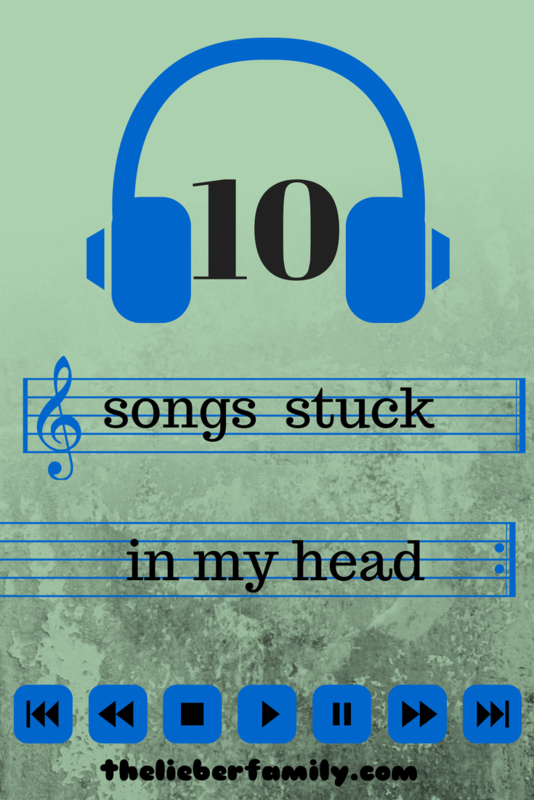 They are songs that get stuck in my head most often. And I separated the list into two groups. I was going to call them "songs I am not ashamed to be listening to" and "songs I am ashamed to be listening to" but in the end I decided to go with "songs on the radio" and "songs I blame my kids for." You can decide which of the other categories they would have gone it! Roar (Katy Perry)-We still wake up to this song every morning and I love getting it stuck in my head, or listening to me kids singing it. As Long as You Love Me (by that JB kid I won't name here)-I don't know why. It keeps coming up on my Pandora and I sing along and then I remember whose song it is. Counting Stars (One Republic)-Something in this song is relate-able. Maybe the fact that he's not sleeping well. Payphone (Maroon Five)-Actually, most of their songs get stuck in my head, but this was the most recent. Call Me Maybe (Carly Rae Jepsen)-The teachers at the kids' after-school program have this song on a play list that the kids are always dancing to at the end of the day. They've got some cute moves worked out! Goodnight My Angel (Billy Joel)-This one is on the kids' lullabye album. It's also the alarm setting that tells us it's time for bed. If they hear it in any other circumstance, they look towards the bedroom in a confused manner. It's Pavlovian! Let It Go (Frozen Soundtrack)-This isn't just me. This song is stuck in almost everyone's head! Get Up and Go Go (The Fresh Beat Band)-Another one on our morning playlist. Benjamin sings this one a lot, so that's another reason I get it stuck in my head. Team Umizoomi (theme song)-Still one of Benjamin's favorites, the other two tolerate it pretty well. Paw Patrol (theme song)-This is one all three kids like. We record it on the DVR and they request it all the time. How about you? Do you have a playlist in your head? A song you find yourself humming in the grocery checkout lane? Link up your own post, or let me know in the comments. 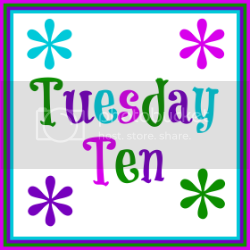 Come link up again next Tuesday, June 10, when the topic will be 10 Things That are Always in my Pantry/Fridge!